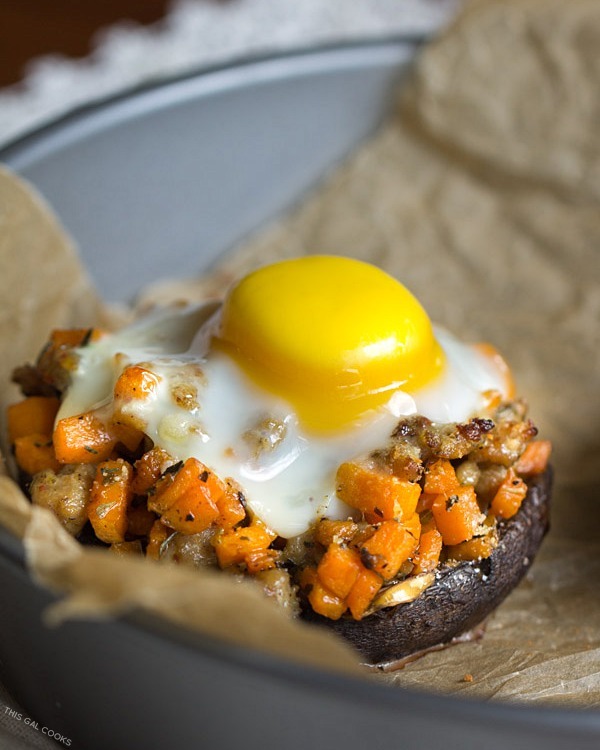 Sausage + Sweet Potato Stuffed Portobello: Chicken Sausage and diced sweet potatoes are sautéed in Italian seasonings, stuffed into portobellos, topped with an egg and baked to perfection. Ah, what comes to mind when you think of Sunday mornings? I think of warm, sunny weather. Tasty homemade breakfasts. A 3-4 mile walk/run. A stroll through downtown Stuart with a stop at a little cafe for coffee and breakfast. Those are some of the things that we enjoy doing on Sunday mornings. Sunday is sort of a lazy day for us. Even if I have things to do around the house, I consider it to be my lazy day. I rarely go anywhere on Sundays, with the exception of a visit to downtown Stuart for breakfast and coffee at my favorite local spots. Most of the time we stay in and enjoy a homemade breakfast. Last Sunday morning we stayed in. I sautéed some sweet potatoes and chicken sausage and stuffed them into two portobello mushroom caps. I cracked an egg over each portobello and then sprinkled a little parmesan cheese on top. Then I baked those little gems until the yolks were slightly runny. While I prefer an extremely runny egg, Ken prefers his cooked thorough. Actually, he prefers his eggs scrambled but that wasn’t gonna work with this recipe. He enjoyed his portobello anyways; he just pulled the yolk off the top. He’s so cute sometimes. 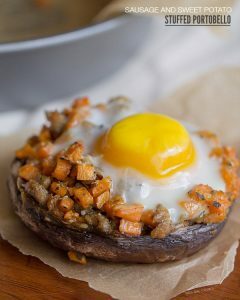 For the picky eater in your life, you could always scramble a couple eggs, toss them with the potato/sausage mixture and then stuff into the portobello caps. Of course, don’t forget to sprinkle with the parmesan cheese. Cheese is a must have in any recipe. That’s how my mind thinks, anyways. Serve these portobellos with you favorite juice or coffee. Coffee is always good. Enjoy. 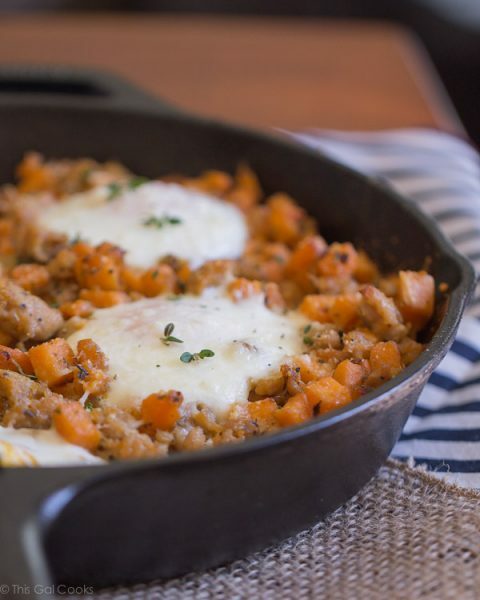 Chicken Sausage and diced sweet potatoes are sautéed in Italian seasonings, stuffed into portobellos, topped with an egg and baked to perfection. Combine the sweet potatoes, spices, pepper, seasoned salt and 1 tbsp olive oil. Mix well. Heat a skillet over medium heat and add the sweet potato mixture and the sausage. Cook until the sausage is browned and the sweet potatoes are tender, about 10 minutes. 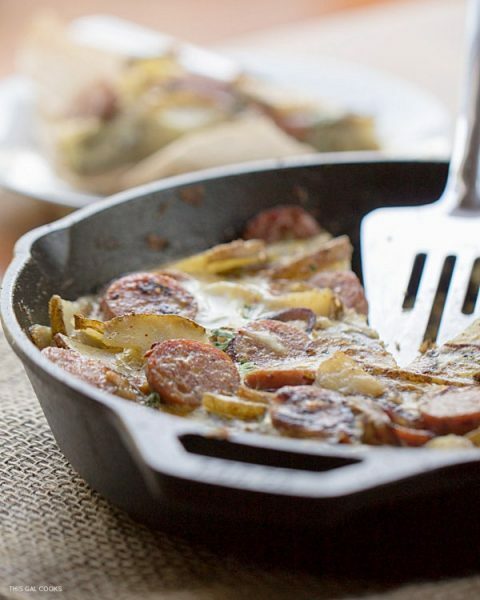 While cooking, break up the sausage with a metal spatula. Place the mushroom caps on a parchment lined baking sheet. Divide the potato and sausage mixture and place into the mushroom caps. Sprinkle each cap with the parmesan cheese (divide the 1 tbsp cheese between each mushroom) and them make a well in the center of the mixture. Carefully crack an egg over the mixture into the wells you created. 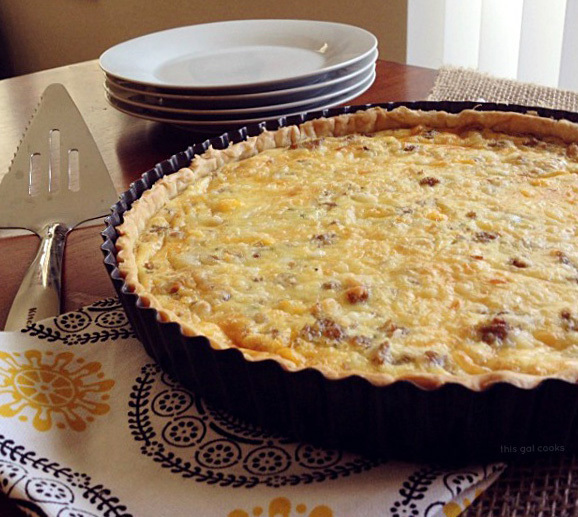 Place the baking dish into the oven and bake for 15-20 minutes or until the eggs are cooked to your desired firmness. This is a work of art, Julie! I’m the same way on weekend morning, especially if we have no baseball. I seriously can’t wait to try this recipe. Have a great weekend! Thank you, Matt! You have a great weekend as well! These look AH-mazing!! They may have to make an appearance for our #MeatlessMonday. Oh yum, Julie, this looks amazing!!! What an awesome and unique breakfast idea – love this, and I know guy in my house who would, too! Thanks for sharing and pinning! Happy Friday! Can you come make that Saturday morning happen at my house? Because it sounds perfect! 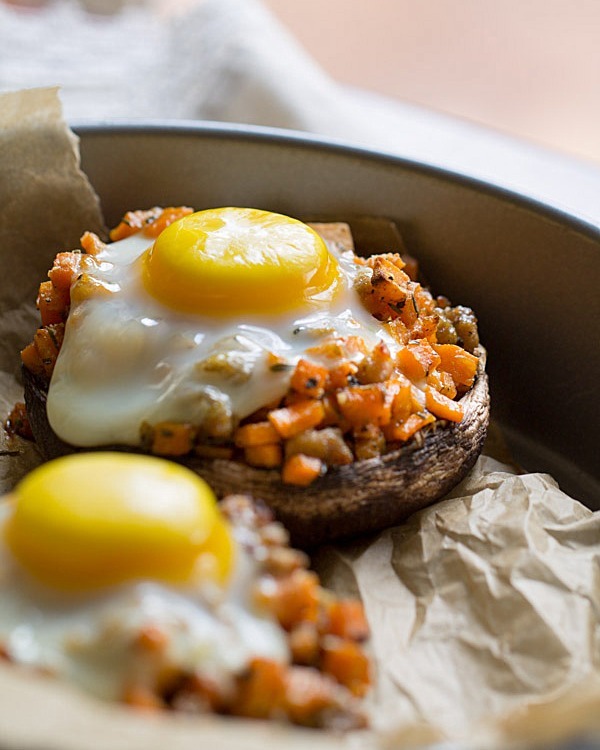 I love how you used the sweet potato in this! Mushrooms and sausage are amazing together. I have yet to add sweet potato! Happy Friday Julie! This looks so delicious girl! 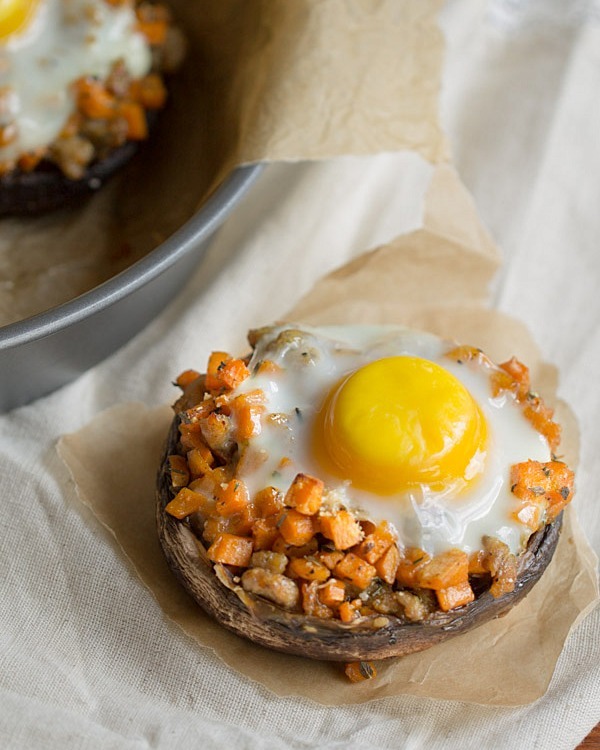 I love me some mushrooms but for breakfast? Yes, please! This a brilliant recipe! Love the idea of using a portobello- extra flavour! I would stay home for breakfast too if I was getting this dish. In fact you have a number of wonderful breakfast dishes I noticed. I love every meal, but for some reason I particularly like breakfast. This dish does it all in a most original way. Since I love breakfast food for dinner too, this would work too. Thank you, Carol! I’m glad you enjoy my breakfast dishes. And I’m just like you – I love breakfast food for dinner too! I’ve been addicted to portobello’s ever since I made a grilled portobello burger! They are so meaty and delicious! I love my eggs runny too, this is totally a dish for me! 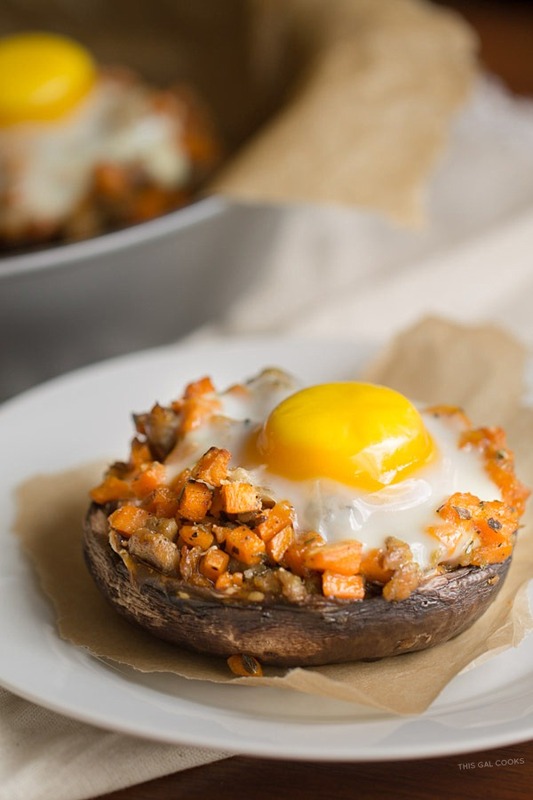 Ok I loved the sound of the sausage sweet potato hash baked eggs but add that into a portobello mushroom cap sounds even more amazing and awesome (and perhaps even a tad bit lighter). Oh I’m so happy you enjoyed this recipe, Vicky! I hope you love it when you try it! Thank you for stopping by. Have a lovely weekend! OMG I love a good hearty breakfast! Thanks for sharing with us at Share the Wealth Sundays! What a great breakfast or anytime recipe. Thank you for sharing at Dishing it and DIgging it link party. 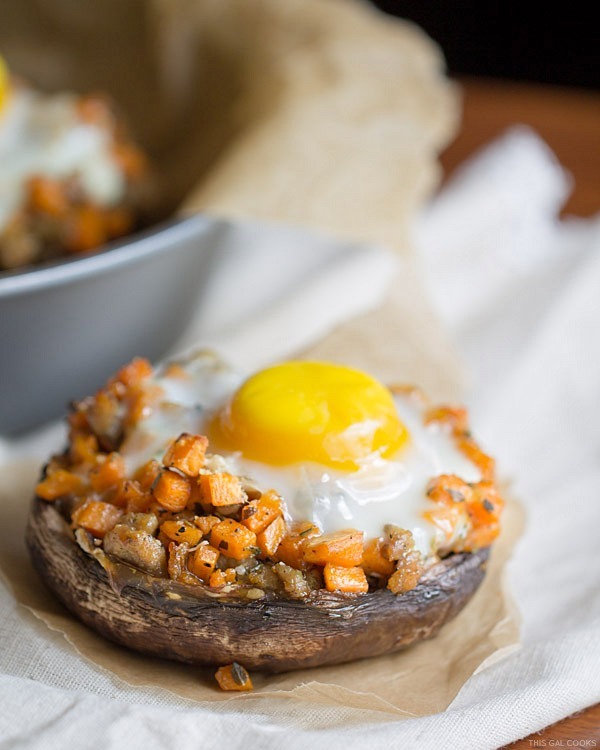 This sounds like an incredible flavor combination with the spicy sausage, slight sweetness from the sweet potato and then the mushroom and egg.. I want it now. I’m so making this!! Thanks for sharing on the What’s for Dinner link up! Oh my! These dishes look fantastic. I want to try them all. Thanks for sharing with us at Funtastic Friday. Looks so yummy. Thanks for sharing at the #inspirationSpotlight party. Pinned & shared.